SLATE spent Spring 2019 with MATRICE school in Alatri, Italy. The comapny brought a series of intermediate / advanced contemporary dance workshops to their students. Most of our news has been shared over wechat since 2016. For inquiries on any specific projects, please send a message on the contact page. Starting on February 29th, SLATE will be offering weekly movement workshops open to the community. Please follow wechat ID: SLATEdance for details and to register. This five month long series of live performances aims to not only showcase the work of artists currently working in these mediums, but also to promote the creation of new works in the fields of dance, theater and performance. As Shanghai is a city with limited venues available to emerging artists working in these fields, this will be an opportunity to promote work that normally has no home. We hope that by offering a space to present, we allow the involved artists to gain recognition for their work, whilst inspiring others to develop their own work in these mediums. Introduce yourself to the audience. What would you like to let our audience to learn more about you? Could you please tell us more about your journey as a dancer? For example, what kind of dance did you started with and why did you transition into contemporary dance? I am originally from Los Angeles, and have been living and working in Shanghai since 2012. During my time here, I founded SLATE contemporary dance company, and started the community art space Basement 6 Collective with some friends. I have been interested in dance since I was about five years old. My mother took me to some ballet productions, and I was hooked. The kitchen in my family’s home became my stage, and everyday I would choreograph what I believed was ballet. I eventually graduated from the kitchen and got some proper training. From the age of 9 to 17, I participated in a strict ballet program at the Performing Arts Center in Los Angeles. My transition into contemporary dance didn’t actually start until much later on. LA didn’t have a big contemporary dance scene at the time, so I was never introduced to it until I was accepted to California Institute of the Arts. At CalArts, we were exposed to various styles of modern dance and had teachers who were in the Martha Graham Company, Alvin Ailey, Limon, and the Netherlands Dance Theater, to name just a few. It took me a while to fully adapt and let go of my rigid ballet upbringing, but when I did, I never looked back. The school expected everyone to not only be trained as a performer, but also be able to choreograph as well as produce your own shows. There was also a strong emphasis on collaboration amongst the other schools, such as the school of music, theater, and fine arts. This has shaped the way that I currently work. I graduated from CalArts with a degree in dance/performance/choreography, and immediately after moved to the middle of America to join a small dance company. At this time, I continued my studies, but added video/installation and film direction to my repertoire. I currently draw on all of these elements in my work. Why did you come to Shanghai in the first place? What do you want to establish in Shanghai? I came to China somewhat randomly in 2011 after I was offered a job here. I had been living abroad since 2009 (in the Czech Republic and later Thailand), and I was looking to live in a big city again. I decided that Shanghai, being the bustling metropolis that it is, would be a welcome change of pace from the smaller cities I had been living in. I didn’t necessarily come here with the intentions of establishing anything. After a short while of living here, however, I did recognize some gaps that I felt could be filled. One of these gaps was the of the diminished contemporary dance scene. In every city I have occupied, I have been able to locate the local contemporary dance hideouts relatively easily. I was shocked to find my search in Shanghai was much more difficult. I haven’t yet gotten to the root of the problem, but it seems that there is no place for smaller dance companies to exist, and maybe not even an audience for it. This was one of the reasons why I started SLATE; simply put, I missed dance and wanted to see it happening here. I would like to do what I can to expose the artists working in this field, and establish a platform for them to work within, with the hopes of developing the contemporary dance scene in Shanghai. For the museum, our intention is to provide an opportunity both for our audience and for young and established artists to appreciate this kind of interactive live performance. How about you? Why are you doing this program with Minsheng Art Museum? Where is the idea come from and how are you going to ease the space of the museum into your performance or your curatorial? I am doing this program because I feel that it is important to give artists working in performance a place to show their work. I think one thing that can halt the creation of work of this kind is the lack of venues to stage such productions. These pieces take a considerable amount of time to create and rehearse, and it’s hard to move forward when you aren’t sure where you can even present your work. There are not many venues here for the performing arts that are easily accessible, so artists working in dance, theater, and performance here have to be very creative with where they present their pieces, especially when they have little to no budget to work with. If you have no venue, then you will have no audience, and the general public’s appreciation of the art form does not grow. The idea of using the Minsheng space for an ongoing performance series was brought to me by one of the museum’s employee’s, Tessa. After I presented two pieces there last year, she had the idea of bringing in more contemporary dance, and asked me to be involved in creating this initiative. I suggested to open up the series to experimental theater and multi-media performance, as I believe artists working in those disciplines also could also benefit from this program. Why did you name the program “In the flesh”? What impact do you want to bring to local audience though this program? From your your own experience in Shanghai, what do you like most about its dance scene and in what ways do you want make a difference? As the human body is a major element in the performing arts, I wanted to give the program a name that reflects the presence of the corporeal human form. When we speak about meeting someone in person – as opposed to hearing about them or seeing them through a screen or medium – we use the idiomatic expression “in the flesh”. Performing arts are unique, especially in the digital age, in the way that they provide viewers with a real, live experience with another human. In regards to Shanghai’s dance scene, I appreciate how accepting the general public has been of pieces I have performed with my SLATE peers. Even though contemporary dance is not regularly shown here, people do seem to have a taste for it. Certainly, there is a interest in contemporary dance that hasn’t been fully tapped into yet within the Shanghai scene. I would like to continue to show work by my company as well as promote the work of other dancers and choreographers. It’s difficult to create a piece when you feel like there is no reason to do so in the first place, so I feel it’s important to create an initiative for these artists. In addition to a performer, I see myself as a facilitator, and hope to encourage dancers and choreographers to create more work whilst giving them more opportunities. Could you introduce SLATE to our audience? What makes it stand out among all the dance companies? How does SLATE engage or plan to engage with local audience? SLATE currently consists of a small group of dancers that are both local and foreign. They are Corine Englander (), Ramsey Dewey (from the USA), Yun Cheng (Born in CN, but now Canadian citizen), guest dancer Nan Nan Lou (Shanghai) and myself. Though we all come from various backgrounds of dance education, we have learned that we all share a similar aesthetic philosophy and movement style. While every one performs, each member also individually choreographs for the group as well. In that way, we are more of a dynamic, dance collective. This group is special in many ways. First, and perhaps most importantly, we are all together purely for the love of what we do. This passion is what unites us, and keeps us dancing as a group. We are not funded - and everyone works other full-time jobs - but all still manage to meet for rehearsals every week. I feel that SLATE engages with the local audience by performing at a number of unconventional venues that are more accessible to the general public. We often perform in art galleries and museums, or create outdoor, site-specific pieces. Last Fall, we even performed in a storage space on a rooftop. The conditions of these spaces are not always ideal for dance, but we know that if we don’t make it work, we would never have a place to perform. I think this adaptability and flexibility in embracing such challenges specific to the Shanghai scene also distinguish us as a group. Share your thoughts on Chinese contemporary dance. Do you have a favorite dancer or dance company? What do you think about the differences of contemporary dance scene between China and the US or any other area you had experienced before? Contemporary dance as a new form of art that the Chinese audience have just encountered within decades, what else would you do to introduce it to local audience besides performances? My observation of the contemporary dance scene in China can be summed as follows: the scene here is almost nonexistent. have been trying to understand why, and its the question that I do not yet have an answer for. Being one of the largest cities in the world, there should be more contemporary dancers and companies, but there are hardly any. I often hear this from other dancers who come here from abroad. It seems that there is a good number of people looking for it, but they unfortunately don’t find it. The few choreographers I know of here are doing great work, but it fails to garner the exposure it deserves. In any part of the world, contemporary dance is often an overlooked art form, but it seems to be an acute case here in China. Historically speaking, though, it is true that it is usually one of the last art forms embraced by a culture. The immediate appreciation is simply not there for dance. The most obvious difference between the dance scene here in China and elsewhere is the size of it relative to the population. There are just not many people involved in it in Shanghai, especially when compared to specific communities in America and Europe. There is absolutely an interest in commercial dance here, which I think plays a role in the absence of purely artistic work being created. It was a similar situation in Los Angeles, a large city that is rich in arts, but one that somehow neglects contemporary dance. I feel that most dancers working here are working commercially. And although I am sure many would like to also pursue more creative endeavors, there is not a large audience for it yet, and the fact of the matter is that it is not lucrative. Besides exhibiting performances, I think it’s important to provide the audience with other ways to engage with contemporary dance. The point of departure for this is more exposure and more education, both of which are gained through first hand experience. You are more than a contemporary dancer, as a choreographer, director and curator, what is your vision about the program “in the flesh”? From your previous works, you manage to bring various elements in one piece, could you share more thoughts to us on multimedia contemporary dance? Especially its development in Shanghai. It is my sincere hope that I can use this program to promote artists that I believe in. The whole goal of this program is to give artists working in these media a venue to realize their creative vision, and attract an audience to engage with these art forms. I like to incorporate various elements in my dance pieces because I think it creates more of a unique experience for the audience, and because it’s enriching working with collaborators. I used to think that I preferred working on my own, and would often create a piece without sharing the process with anyone else. More recently, I have found collaborators working in sound, fashion and design that not only contribute in their specific discipline, but also give constructive input that helps shape and inform the piece as a whole. Globally, there is a trend of choreographers integrating multi-media elements in many forms into contemporary dance. I don’t think it’s absolutely necessary, and I do also enjoy pieces that are purely contemporary dance. Personally, I feel it’s the only way to express everything that I want to get out. But when I visualize choreography, I now often think about the visual elements involved besides the movement itself. So I suppose my work is continually evolving. SLATE is the contemporary dance company founded by Anneliese Charek in Shanghai, China. Its members and collaborators appear around the city in site-specific performances, often in unconventional spaces that serve as one-time venues. Recently, Anneliese choreographed a performance entitled “As One” at 1933, a historic slaughterhouse in the Hongkou district in Shanghai. Neocha: Who did you collaborate with and what was the process in which you worked together? SLATE: The showing of “As One” at 1933 involved a number of collaborators: the sound artist Pan Daijing, fashion label OBJECT OCCULT, and 12 dancers from the Suzhou Dance Company. I also worked with the ladies from Redscale Studio, Tina Blakeny and Margot Hamer. Over the summer, Tina and I had made a “Dance for Camera” film. That film was then manipulated and used during the performance. Neocha: How do different venues, architecture or audiences change the performance? What was unique about 1933? SLATE: Since I’ve been choreographing pieces in Shanghai, most of my work has become site-specific dance. This is due to the fact that Shanghai has virtually no small theaters or performance spaces for this type of work. When creating a piece I always have to keep it in mind that it will be performed in an unconventional performance space, which actually is an interesting challenge. The piece then directly reflects the type of place that we will be performing in. The venue space also changes the performance a lot for the dancers as they have to adjust their movement quality to work in the space. For the performance at 1933, we really took into account the architecture of the space. Redscale Studio created an installation that took advantage of the curving hallways. Unlike previous performances in other venues, the dancers had a lot more room to move around freely. In general, there were many more interesting opportunities to respond to the space with this performance. Neocha: What themes did you want to address in this performance? SLATE: The choreography was based around the theme of the individual versus the mass and conformity. It was inspired by what I observed from the dancers during my time with them. I was surprised to find that they are professionals in a creative field, but are never actually asked to be creative. They aren’t given the opportunity to make their own work or improvise, and mostly just execute steps handed down from a “master”. So I made the piece centered around the concept of the dancers breaking away from conformity. I had each dancer create a solo using movements that they made which we then refined together. It was my hope that this would encourage them to start generating their own work, and then find their individual artistic voices. 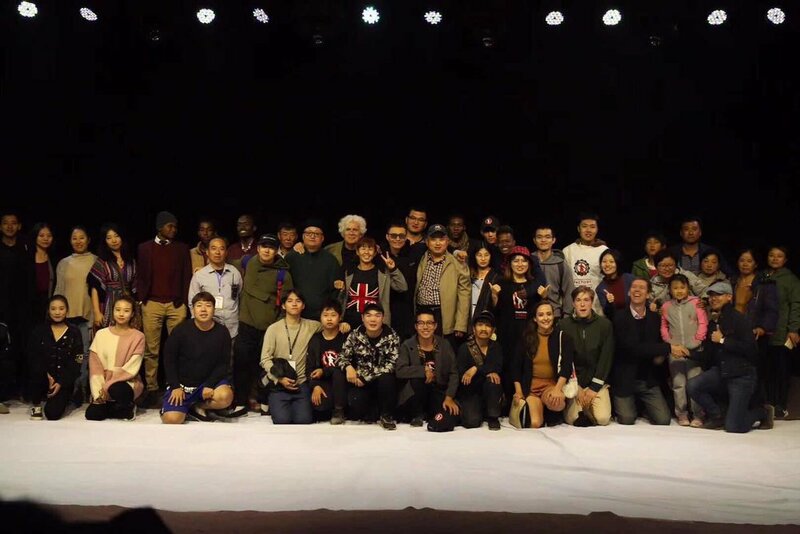 Neocha: How does your work tie into the dance community here in China? SLATE: When I first arrived four years ago, I was really bothered by the fact that a city as big as Shanghai had virtually no small performance groups, performances, or classes to attend. This is something that is pretty easy to find anywhere else in the world, even small cities. There were a few independent local choreographers that showed work sporadically. I started my small dance company SLATE two years ago just because of this. Since nothing else was around, I felt like I had to start something myself. For myself, I think it is necessary to create work and present it in unconventional spaces for dance. I have most of my performances in art galleries, or as part of outdoor events and fairs, that are normally not a place for performances. Inserting my work into these alternate venues has the added benefit of exposing people who might not normally be interested in contemporary dance to my work, and has opened up opportunities for other kinds of collaborations like what we did at 1933.